Visionary leaders united in providing, advocating, and creating education excellence for Montana students! SAM was organized as an association of administrators in 1970. SAM represents the interests, aspirations, and professional leadership of Montana administrators. Over 1000 members network under six affiliate associations to promote GREAT Montana Schools, supporting leaders passion for providing an outstanding education to Montana's children! SAM ... Visionary leaders united in providing, advocating, and creating education excellence for Montana students! Leadership: We believe that instructional leadership provided by school administrators is essential for empowering, inspiring, engaging, and helping students to grow, succeed, and lead. Integrity & Professionalism: We promote and demonstrate the highest level of integrity and professionalism, both organizationally and individually. We believe it is these traits that create the foundation vital for success. Advocacy: We serve as a united, proactive organization of educational leaders that advocate for State and National legislation to ensure Montana students will receive a quality education supported by adequate and sustainable funding. We strive to assure that all students have equal access, are safe and healthy, and will be successful. Professional Learning & Services: We believe that high quality professional development, mentorship, and supportive member services are critical to individual member and Montana student success. SAM is a member-led, model education organization dedicated to developing instructional leaders advocating for student success. 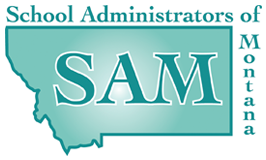 SAM is held in highest regard by all stakeholders for providing strategies, resources and tools to positively impact educational excellence for all Montana students. Professionalism, Integrity, and Leadership: SAM models and promotes the highest levels of professionalism, integrity and leadership of its affiliates to create a foundation vital to success. Advocacy: SAM members will be equipped with accurate information and prepared to use it to advocate for public education. Professional Learning and Services: SAM will extend and expand the professional learning delivery system using the expertise of the SAM affiliate’s, as well as other service providers through professional development, mentorship, and other member services. Montana Association of School Superintendents (MASS): Members of MASS serve as school superintendents, assistant superintendents, or other central office personnel who hold titles with line staffing equivalent to that of assistant superintendent. Montana Association of County School Superintendents (MACSS): MACSS serve as a liaison between schools, the state and county governments and the taxpayer, as well as administer the small stand-alone elementary school districts. Montana Educational Technologists Association (META): META members endeavor to unite educational technologists for the purpose of advocating for an supporting the visions, policies, practices and funding for technology within all aspects of teaching, learning, and professional productivity.